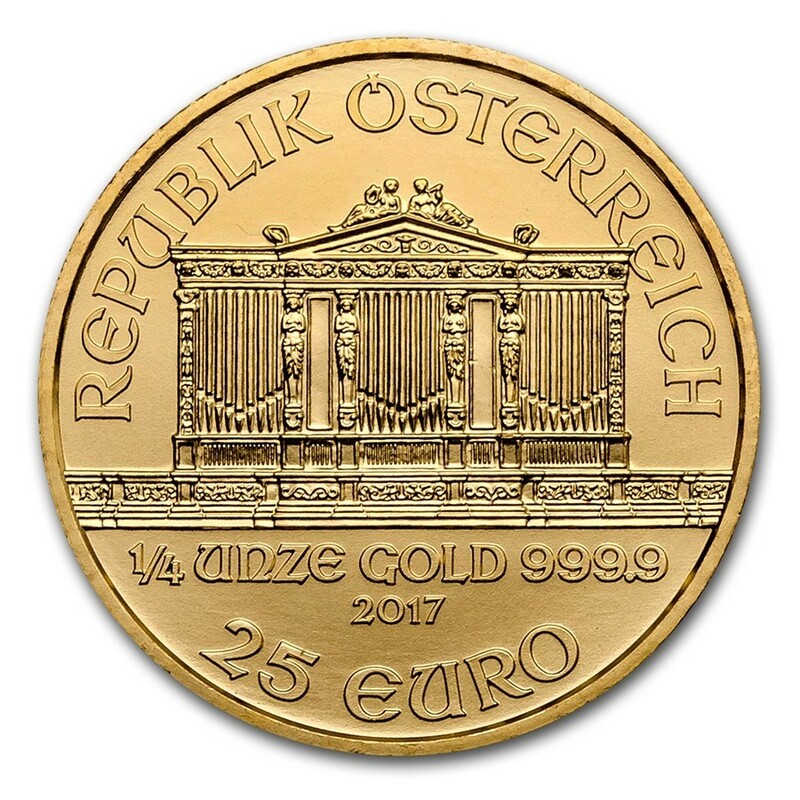 The Austrian Mint, and these 1/4 ounce Gold Philharmonic coins in particular, are among some of the most liquid and frequently traded gold bullion coins in the world. Coins produced by the Austrian Mint have an excellent reputation in Europe and around the world, ensuring large international demand for these coins. Holds 1/4 troy ounce of .9999 (or 99.99%) pure gold bullion. Coin made and guaranteed by the country of Austria. Manufactured at the Austrian Mint. Legal tender value of €50 Euros, backed by the Austrian Government. The coin’s obverse design features various instruments from the Austrian Philharmonic. 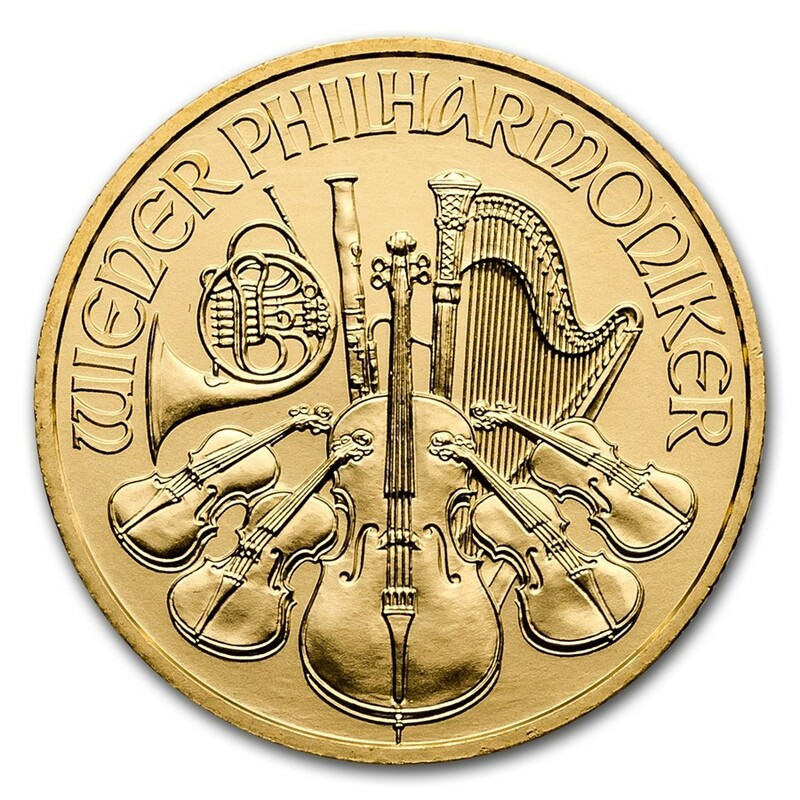 The coin's reverse design features the organ in the Musikverein, one of Austria’s most famous concert halls. While gold coins and bars are made in all sizes, from 1 gram all the way up to Good Delivery Bars (the gold bars depicted in movies), they are primarily bought and sold in 1 ounce increments. Having gold in 1/4 ounce coins yields some unique benefits. The first benefit of owning gold in 1/4th ounce size means you have more control over how much gold you’d like to sell at any one time. This is very important if you believe the price of gold is going to be much higher in the future then it is today; the smaller size means you won’t have to sell off a whole ounce every time you choose to sell. Next, the smaller size also makes it affordable if you are buying gold on a budget. Also, if you wanted to give someone a gift for a very special occasion, the 1/4 ounce size is just large enough to be special, but not so large that it breaks the bank. Additionally, there is a small, but active, group of investors who believe that smaller coins like this would be ideal for an emergency currency situation. This group believes that these types of fractional gold coins could be used as currency or a medium of exchange in a pinch. Or, in case of a banking holiday, they could simply be sold off to local coin dealers or businesses. The Austrian Mint has a long and illustrious history that dates back to the 12th Century. In 1194, Richard the Lionheart of England paid a ransom to Duke Leopold V of Austria. Leopold decided to strike the silver into coins, thereby unofficially founding the Austrian Mint. You can also purchase the 1 ounce Austrian Philharmonic here. Best Prices on Gold Philharmonics!